Hi everyone! Today I am going to review my September Glossybox. 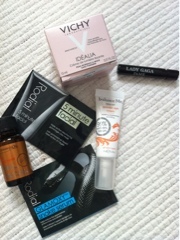 This months Glossybox had mixed reviews, not my favourite box but still I was pleased! 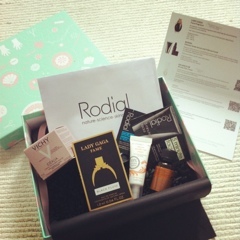 The box was very pretty, pastel shades with a beauty themed pattern designed by freelance illustrator Maggie Li. In my box I recieved the following. Lady Gaga perfume- this perfume is a sweet scent, it states it is "an opulent, crushed floral fragrance thats black like the soul of fame but transparent once airborne". It is a black liquid that becomes clear, cant say I see this as the packaging is black! But the scent is lovely with the label stating its "tears of belladonna, crushed heart of Tiger Orchidea with a black veil of incense, pulverized apricot and the combinative essences of saffron and honey drops". Wow what a description! thats one way of putting it! It definately smells of apricot and honey! I really like the scent but it didnt seem to last long at all. Vichy Idealia Day Care Cream- this cream has a pretty pink formula that smells of roses. It left my skin radiant and soft! Love this! It feels silky and glides on easily. You only need a little which i applied in the morning, it appeared to make my skin glow and my foundation sat lasted with this cream, no need for finishing spray! Rodial Glamoxy Snake Serum and 5 minute facial- these intrigued me as I had heard a lot about snake serum. I did not like the snake serum sample packaging with a black snake on it! Put me off! But when I applied it it was fine, nothing bit me!! It went on well and wasnt sticky, it made my skin feel taut and like I had recieved a spa treatment. Would I buy this again? No as it didnt wow considering the price tag of £29 for 10ml! But on the other hand the 5 minute facial did, it is a clay mask that you can apply once a week. It left my skin feeling soft like a babies bum! I need something quick and this literally was on and off in 10 minutes which suited me. My skin still felt smooth in the morning as i applied this before bed. Maghrabian oil- this states it is "nutrition, hydration, conditioning, softness, shine and long term vitality". It certainly smells divine! Morocco springs to mind when I smell this oil, spices and fruit! It was easy to use, yet I was worried it would make my hair oily! But instead it made it shiny and glossy, my hair looked in such good condition! It was as though i had just coloured it (my hair goes shiny and looks conditioned after its dyed!) I was impressed! It contains Argan oil which a lot of bloggers have said is fab so this was my first experience. I wonder if olive oil would be just as good? As this is £24 for 100ml! I will test it! Balance Me Wonder Eye Cream- I am a fan of Balance me products after trying a lip salve. This eye cream did not let me down with a scent of flowers and oranges it was lovely to apply as I felt "clean" wierd statement I know! But the scent is fresh and the cream is refreshing. The cream is smooth and easy to dab on my bags! It made my eye area soft and cool. The packaging is easy to the eye and crisp. I loved this eye cream but it is a bit pricey for me £20 for 15ml. So all in all I was pleased with these products. Have always loved my Glossyboxes lets hope nexts months is just as pleasing. Do you get them? If so what do you think? And if not what other beauty boxes do you use?